Irish brewer Guinness has joined Carlsberg in scrapping the use of plastic rings on its beer cans. 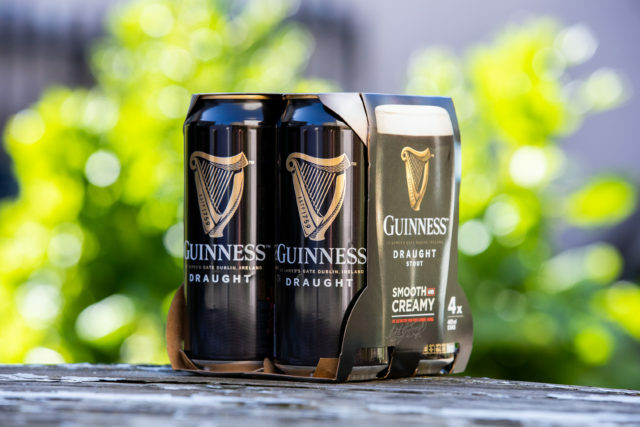 The Diageo-owned brewery’s multi-can packs will be replaced by cardboard packs, which are sustainably sourced, recyclable and fully biodegradable, according to the parent company. Diageo will also be removing plastic packaging from multipacks of beer products including Harp and Smithwick’s. The company is investing £16m to reduce the amount of plastics used in its beer packaging, which will be rolled out to retainers in Ireland from August. The new packaging will be made available in the UK and Guinness’ global markets from 2020 onwards. It is hoped the change will help Diageo cut its wastage by 400 tonnes per year, equivalent to 40 million 50cl plastic bottles. Great packaging is essential for our products. Consumers expect our packs to look beautiful, be functional, and sustainable,” David Cutter, the drinks giant’s chief sustainability officer, said. The announcement comes after Danish beer firm Carlsberg said it would stop using plastic rings to hold beer packs together last year, and replace them with recyclable glue. Diageo created two new senior leadership roles dedicated to furthering the drinks producer’s commitment to society, the environment and sustainability in November last year. Cutter became the company’s first chief sustainability officer (CSO), in addition to his role as president of global supply and procurement, while Kate Gibson joined in March 2019 in the newly created role of director of Diageo in society, leading a team responsible for ensuring that Diageo “plays a positive role in all the communities” that it operates in. Diageo announced new plastics targets last year, with an aim to ensure 100% of its plastic use can be recycled by 2025, and to make its plastic products exclusively from recycled material by 2030.